Honda motorcycle and Scooter India Pvt. Ltd company has launched india’s most famous and wholly-owned motorcycle production and other sales subsidiaries in the country of India. This company also established the latest and easy to handle motorbike of 110cc model CB Twister. This motorcycle will be available for sale in India in the year of 2010. 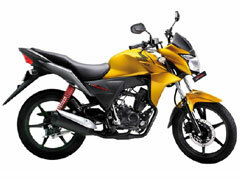 The owner company of this 110cc CB Twister Motorcycle is planning to displays this model at the Auto Expo 2010. Design of this motorcycle is very charming, and this style was taken from the school of large sized European motorcycles. This motorcycle has many different features like low friction, high quality air-cooled single cylinder 4 stroke 110cc engine. India is at number 2nd in largest market of motorcycles in the entire world. The industry of motorcycle sales in India has reached approximately 7.9 million units per year. The sales of the HMSI company’s motorcycles have grown up to 9.8 million. The launching of CB Twister motorcycle is the first introduction of 110cc model by HMSI Company. The major purpose of this company is to fulfill expanding customer requirements in the latest growing market of India where 110cc motorcycles are estimated for approximately 50% of total motorcycle sales as well.